Feel like a million dollars with this sophisticated Tommy Hilfiger strap watch. 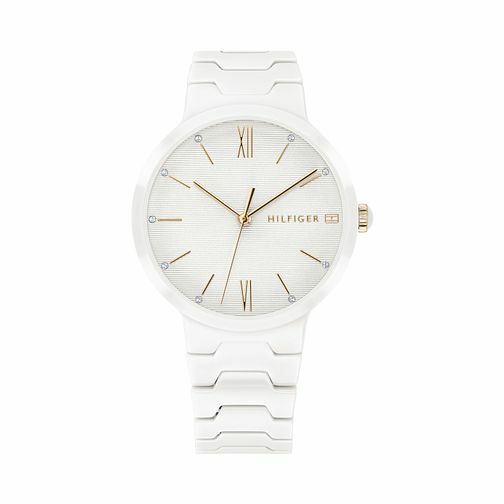 Sleek and white with crystal markers dotted around the 40mm dial, this eye-catching timepiece reflects the superior style sense that Tommy Hilfiger is known for. Tommy Hilfiger White Ceramic Bracelet Watch is rated 5.0 out of 5 by 1. Rated 5 out of 5 by Anonymous from Love the look of the watch Bought the watch online and visit the Kingston shop to shorten the bracelet. They did it straight away!